Robbie Horn has returned to Bonnyrigg Rose as the club’s new manager, having left Berwick Rangers last month. In a statement, the Rose said they were “delighted” to welcome Horn back to the club, where he was previously so successful. The 41-year-old was manager of the club between 2015 and 2017, before making the step up to senior football. David Burrell, who was previously interim manager, has agreed to stay on at the club as assistant manager. He was assistant to Horn at Berwick Rangers, so that’s not a role unfamiliar to him. Bonnyrigg also announced that Jonny Stewart will join the coaching staff with Sean McAuley, Michael Burgess and Danielle McNaught. The club statement read: “We would like to place our thanks to David who came in at short notice on an interim basis and maintained our momentum at the top of our Conference. Robbie Horn resigned as Berwick manager last month, citing health reasons, but, having taken a short break from football, is ready to go again. 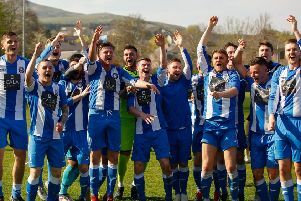 “With me not having been in the right health, I felt I wasn’t able to do my job properly and it was the right time to move on,” Horn said after his departure from the League Two side – who were then taken over by Penicuik boss Johnny Harvey. Horn will be reunited with Burrell, who left Berwick with him last month. “He has been by my side, I brought him into Bonnyrigg and took him to Berwick. Bonnyrigg Rose are top of the East of Scotland Conference B table, having won eight and drawn one of their opening nine games.